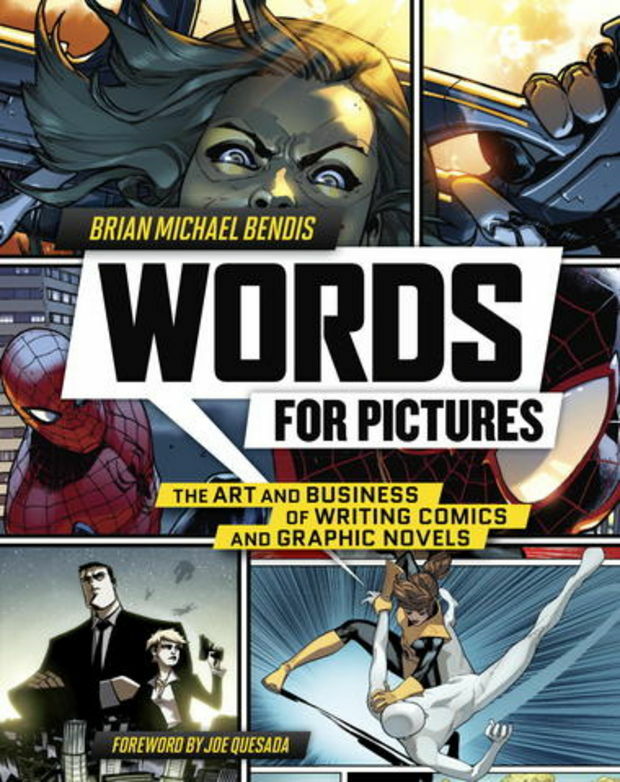 The subheading for this book by Brian Michael Bendis is ‘The art and business of writing comics and graphic novels.’ And that is exactly what you get. I get asked at cons a lot about what sort of things can help you write comics. I’m not asked this because I’m anything special but more that I just talk about process so much that people assume I know what I’m saying. Jokes on them but it whiles away the hours on the con floor. So when people ask me for tips and advice and whathaveyou, I invariably tell them to get Scott McCloud’s stuff and simply devour it. Set up the bbq, decant the HP sauce at room temp, and imbibe those pages like your future career writing Spider-Man depends on it. Because it most certainly does. There is no denying the dominance of McCloud and his complete coverage of the comic medium structure and the accessible way he lays it all down. That layer and level of craft has been owned and so I was so pleased to see Bendis’ book is not an attempt to go this path. No, Bendis instead delivers the perfect partner volume to McCloud’s work. WORDS FOR PICTURES treads water in a few ponds and all of them really important. In fact, I’d go so far as to say this is ‘must read’ stuff for people right when they make the decision that they want to make comics and break into comics. I wish beyond belief that I had this book a decade ago. It’s full of the little tips and tricks about breaking in that I had to hunt around and find or stumble across over the course of years of living the life. Here, this book presents it all to you in one handy weekend read. I’ll repeat this – WORDS FOR PICTURES IS MUST READ FOR THOSE EMBARKING ON THE JOURNEY OF MAKING AND BREAKING INTO COMICS. There is no way around this, there are lessons here you need to learn. There are lessons here you have no doubt been told by someone else already but you weren’t sure if it was right. It is right. It’s here in this book, please read it a few times, learn it, love it, and then jump into the four colour waters, it’s always warm in here. To give a quick rundown – this book drops knowledge and science on some of the early tripping blocks creators, and especially writers, face. The editorial round table on how to meet editors, stay in contact with them, and not be a pest is worth its weight in gold. The artist round table about what they dig and loathe in scripts is fantastic. Learning how to write for your artist is super hard – and a lot of that is because nascent writers don’t have many artists with which to collaborate and experiment so we have too many scripts written in a vacuum and not considering the collaborator. This chapter breaks down a lot of what you need to hear and the sooner the better. The page with Kelly Sue’s pitch docs on it is just glorious. These are the sorts of things we don’t see anywhere near enough of. Trying to find, share, download, hack, ask politely for, and imagine pitch docs is hard so here we get a peek into some good ones – especially because Kelly Sue is irreverent in hers and that will free your mind – it did for me. If you need to learn the art of comics, read McCloud, if you need to learn the art of making comics, read Bendis. I think it’s that simple. Now, I know the book isn’t without its faults. It almost felt a little too quick to read. I would have liked to see more process about script breakdowns and real craft – though once you start talking about scripting gutters and the like then you run into McCloud territory so I see why this line was drawn. This book might not be perfect in the way McCloud is but I don’t know of anything better, and I know Bendis drops enough knowledge I wish I had five years ago that I know this book is completely worth it. So the next time someone asks me what they need to help them make comics I am going to send them to this book, in a heartbeat. If you dig this book, or want to know more about the things you need to be a writer with a level head, click these links. I like my writing craft books to have a personal tone. King’s author writing voice is something I could read for months on end – and I dig STORY (to degrees) and some of those other staples but if you want great ground level sensible stuff that has worked wonders for me, hit up the McCloud/Bendis/King triumvirate. That’s it, now go read something every day, and write something every day.